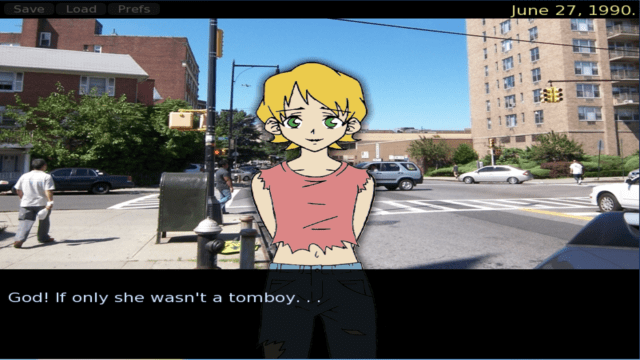 I will admit that, upon hearing that there was actually a visual novel based around the September 11 terrorist attacks, I was a bit skeptical. While the idea of having a portrayal of fictional events taking place during a real life historical tragedy is nothing new, the subject matter of this one is rather sensitive. As a result, it is very likely that something like this would not be done by a larger company, regardless of the game’s intention. Naturally, it would be difficult to expect a non-professional team to be able to treat something like the September 11, 2001 World Trade Center attacks with the care it deserves, and not feel like it was done solely as a gimmick. However, this concept, if done right, could end up turning into something amazing. Ultimately, that begs the question of into which of those categories Broken Hearted falls. To get one thing out of the way, Broken Hearted has almost no player interaction. The game is basically a book except with pictures and music, and the only thing the player is doing is advancing dialogue by clicking. There are no choices that the player is given, either; it is basically just a straight shot to the end. Naturally, it goes without saying not to expect anything gameplay-wise from Broken Hearted. The game does allow you to save at any point, resume from where you were and also rewind the text any time you want, which is pretty convenient. The art style, I will admit, is one of Broken Hearted’s biggest weaknesses. The character models look very basic, bland and expressionless, and they all look very similar to each other. In fact, it is very easy to tell that the same base model was used for just about every character. In addition to this, the background is also made up of stock images of the real New York City. On one hand, there is the obvious complaint that the art style clashes with the realistic look of everything else, especially considering there are some real life people in some of the backgrounds. However, in an artistic sense, that may actually work in the game’s favor seeing as how one of the strengths of Broken Hearted is the realism of it, and that the realistic looks of the background combined with the anime style character art reminds you that this is all real. The music was also particularly well done and played a great deal in building this game’s atmosphere. Now, if anyone was paying particularly close attention, one may have realized that I have said similar things about this game that I have about another game that I recently reviewed; Depression Quest. While there are definite similarities between the two, it is at this point that the key difference becomes apparent. While I personally felt Depression Quest explored its subject matter in a shallow and half-hearted manner, Broken Hearted, I felt, handled it the exact opposite way. It managed to portray a fictional account of someone affected by 9/11 in a way that shows you full well what it was like for the individual. The main story structure of Broken Hearted is handled in a very unusual fashion by the standards of just about any form of media. 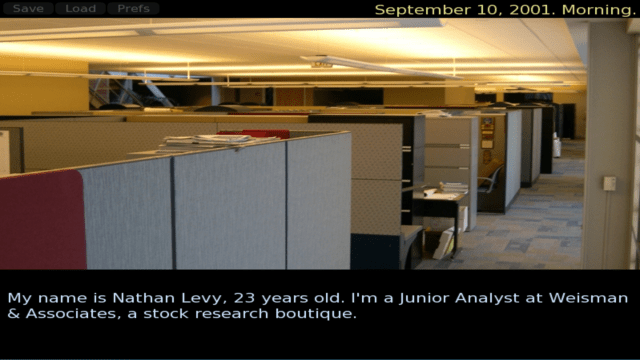 Instead of having the World Trade Center attacks occur during the game’s climax, like one would expect, they instead occur very early in the game. The actual narrative of Broken Hearted is meant to show the lasting effects of the attacks rather than simply showcasing the attacks themselves. The story stars Nathan Levy, a 23 year old New Yorker who works at the World Trade Center and conveniently ends up late for work on the morning of September 11. After realizing that his friends and fiancée were killed in the attacks, he falls into a state of depression as he has frequent flashbacks to his childhood memories. That right there is enough to sum up the events of the game well enough, but what makes Broken Hearted special is how it tells these events. 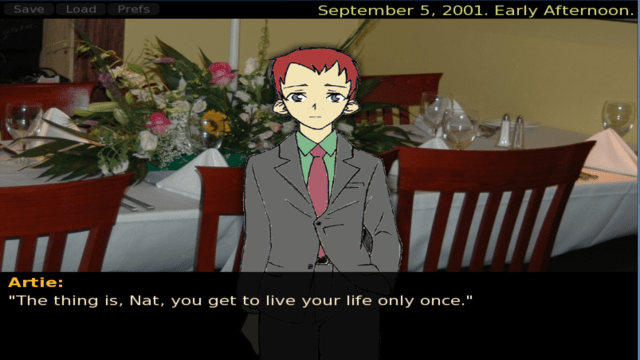 About half of the game is told through flashbacks to Nathan’s childhood and his relationship with his friends, and the other half is Nathan attempting to cope with his grief over what happened. In just about every other story, this would be a bad thing and, admittedly, I was not impressed by Broken Hearted at first. Initially, I found myself thinking that it was poorly told due to the flashbacks not having much to do with the main plot and seeming irrelevant and uneventful compared to the main storyline. However, while playing Broken Hearted, something eventually just came to an unprompted realization about this game, that realization being that this game is effective because of it being uneventful. 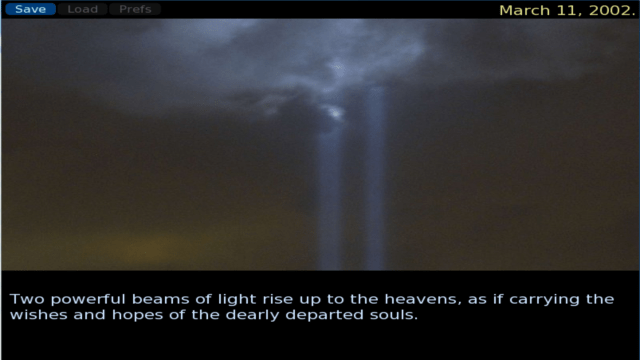 It is due to the flashbacks of his childhood occurring right after they died in the World Trade Center attacks that their deaths end up becoming harsher. Despite Nathan’s initial realization of the attacks not being as powerful as one would expect, Broken Hearted makes attacks more devastating, retroactively, by developing its characters after you have already know that they will die. That is ultimately Broken Hearted’s biggest strength; the story shows the events of one person alone. Anyone could have said that people died on 9/11, and anyone could have said that terrorism is bad. Broken Hearted, however, manages to show what it was like firsthand. In fact, I would not be surprised if it turned out that the writer suffered as a result of the attacks himself, and that this was written based on personal experience. This ends up resulting in a really depressing and emotional story that takes advantage of the fact that it is told in a very non-game-like way. Broken Hearted is admittedly light on interaction even by visual novel standards, but I can definitely say that, as a story, it is very well executed and makes for quite an emotional experience. 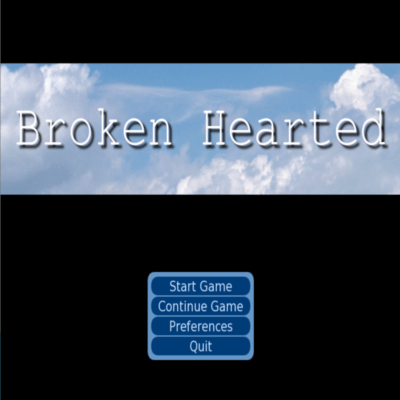 Broken Hearted is available for free on the developer’s website, and it will only take about an hour to complete, so it is hard not to recommend it.